Do you like hunting, hiking, fishing, adventure or other outdoor activities with your partner? Did you feel that you need better communication between you two? If your answer is yes, then this article is for you. A pair of perfect two way radio can solve your problem in a moment. And in this case, the Motorola T605 Talkabout is one of the best choice for you. The Motorola T605 is a wonderful device in a word. This two way radio is suitable for any kind of outdoor activities because of durability and longer battery life. The radio has longer distance of connection. Additionally, the flash light and amazing NOAA radio weather alert are placed for your better security. The high performance has made this radio best among the similar products. The radio is waterproof as well with the stronger IP67 rating. We truly appreciate this device as the waterproof two way radio! We commonly face rain while we’re in outdoor activities. Rain generally damages electric devices. Though this T605 is an electronic device but it can survive against rain. That’s because the Motorola T605 H2O has strong IP67 waterproof protection. IP67 means your device will survive in 1m depth water for up to 30 minutes. This is strong enough to water splash or heavy rain. This device has 22 channels and 121 privacy codes with each. That means you have total 1662 channel combination which is the easier way to find an active channel. You now have the ability to find a channel within a moment. That’s so cool feature. The most important feature is this. The advanced built in flashlight is very useful in any situation. The White LED is generally for flashlight, and the additional red LED light is for emergency situation. You can use the red LED light for gaining concentration of others while you are in trouble. You also have option to need help by pushing the emergency button. You have 35 miles of wide connection range with this device. This is too cool. When we’re in outdoor activities, we generally go 5/7 miles of distance than each other. But the device has 35 miles of range. That’s why this radio is suitable for professionals too. The T605 has built in NOAA radio weather alerts service. So you will get notification for upcoming weather condition. That’s a great feature because the NOAA weather alert supports most of the areas. So you can stay connected with this device. You may get prepared for unexpected weather conditions. The device runs with rechargeable NiMH battery and also can run with 3 “AA” standard size batteries. You can keep extra AA size battery with you in case of emergency use. But I don’t think that’s really necessary because the rechargeable battery can be charged with AC or DC power and you can easily charge it with your car or laptop. This is surely a great addition. Nowadays, micro USB power port available everywhere. So, the manufacturer added an option to charge your device with micro USB charging port. It increases the easy of usage. The device also offers you to operate the device hands free. You have headphone for operating the device while you’re busy with another work. This device is compatible with other radios. You have option to communicate with other GMRS/FRS radios regardless of other brand. You can use it by being on the same channel and the same privacy code. The NiMH battery let you to use the device for 8-9 hours with a charge. Also, you have 23 hours of usage time with the AA batteries. So, you can use it anywhere and can go wherever you want. Besides of the essential and wonderful features, this two way radio also keeps additional special features such as Easy to retrieve design, PTT power boost, Quick ask for help, Water activated flashlight etc. surely, this one is the best radio for you. Well, you may notice the model name of these two devices. One is T600 and another is T605. Basically there is not much difference between the products. Actually, the T605 is the upgraded version of T600. There was no carrying bag or car charger included with the older T600, but with the T65, you have the facility. You can now carry your devices easily in a bag. On the other hand, you have the option to charge your radios while you’re on the way. You can recharge the NiMH batteries with the car charging port. Obviously, this is a wonderful and useful addition. Without the two differences, there is no other difference with the radios. The T600 and the T605 is same as one another. 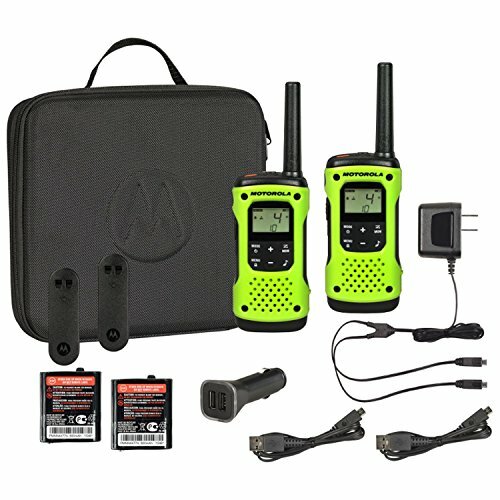 The Motorola T605 is a wonderful two way radio. This device is considered as best! But you know, a single device doesn’t have all the features. Let me clear. Another best two way radio is Midland GXT1050VP4 (you can read this review) . That device is full with many of special and amazing feature such as, LCD display, eVOX, more channels, Channel scan etc. Though that is one of the best two way radios but the device has JIS4 water protection only. That is not cool enough. That’s because you may face heavy rain in your adventure and the JIS4 is not strong enough to protect the device. But in the Motorola T605, you have stronger IP67 water proof protection. That means your device is ready to survive with you in any kind of weather condition.